The city of Bruges was home to a number of great painters, of them the Dutch Renaissance painter Gerard David. As one of the last great painters of the Bruges School, David’s works were rediscovered in the late 19th century. Born in the Netherlands, in the town of Oudewater, he then traveled to the city of Haarlem, where he studied with the painter Albert van Ouwater (1440 – 1475), founder of the Haarlem School of painting. Moving to Bruges, where he would spend most of his career from then on, he joined the city’s Guild of Saint Luke for painters. The leading artist of the guild at the time was Hans Memling (1430 – 1494), succeeding the style of Jan van Eyck (1385 – 1441) and when Memling died in 1494, David became the leading artist of the city. He eventually became dean of the guild in 1501 and became praised for his brilliant use of coloring in painting. He followed the great masters of Bruges, especially Memling, but also became influenced by Quentin Matsys (1466 – 1530), a leader of the Antwerp School of painting. The Antwerp artists would eventually replace the Bruges School as the leading style in Belgium. Some of his best known work was done in altarpieces throughout Bruges. One can see his skill of coloring, but also a graphic depiction of ethical responsibility as subject, in The Judgment of Cambyses, of which the right panel, The Flaying of Sisamnes shows a corrupt judge being flayed alive in public. 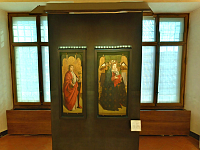 There are also his religious altarpieces, the Triptych of Jean Des Trompes, The Mystic Marriage of Saint Catherine, Madonna Enthroned and Saints, and his oft-seen panel of the angel in a flowing bright blue robe in The Annunciation. Perhaps his most famous piece is the Madonna with Angels and Saints, which he painted without commission for the Carmelite Nuns in Bruges. 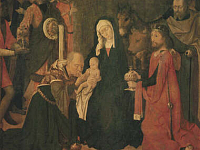 Of his works in the Uffizi Gallery are the Deposition and an earlier piece, Adoration of the Magi. David was given an honorary burial in the Church of Our Lady in Bruges.